Ours cosmetic bag has lots of pockets for all your things: including secret pockets inside for those discreet items, and a short pocket outside for your favorite lipstick, as well as longer ones for pens or lip-gloss. 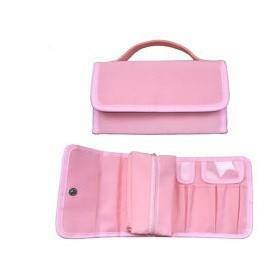 There is no need to delve into your cosmetic bag all the time anymore. Just Load all of your items in this great insert, place it in your purse or bag, and keeps your contents organized and accessible when changing from handbag to handbag in an instant.